“Get back in the Box” doesn’t mean do as Jack-in-the-box does once he comes spurting out to delight a child with surprise, it’s what SHEs (Sidetracked Home Executives) do when they’ve gotten away from using the system in “Sidetracked Home Executives: from pigpen to paradise” the book my sister and I wrote in the seventies. The “box” refers to a card file box holding 3x5 index cards with household chores (one job to a card) written on them. The cards are color coded to denote frequency; yellow for daily, blue for weekly, white for monthly and pink for personal actions. More about the system later. Getting organized starts with a desire in your heart to have peace instead of chaos when it comes to the important elements in life. We all have to eat so we need food in the house and time to prepare it. Unless we’re nudists, we need clean clothes so we need to do laundry regularly. We need rest, so we need to schedule our days to get enough sleep at night. We also need play, worship, exercise and friendship in a sensible routine. When I was disorganized my husband and I fought constantly over the chaotic house. I was always out of food (but somehow managed to be overweight). I took care of the household finances and I was always overdrawn. Laundry was always piled in both forms; clean and dirty. Every room was cluttered and the master bedroom was the worst….well maybe the kitchen. 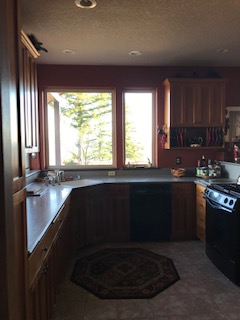 Our cars slept in the drive-way every night because the garage was crammed with the results of saying, “Just put it in the garage for now.” I took this picture of our kitchen today, just to show you I'm living an organized life today. Every New Year’s I made the decision to get organized but because my reason was wrong I ended up each year deeper in chaos. 15 years dragged by and I actually got to a point in my life where I thought I’d never be organized, like it was this heavy cross to bear. My reason was always to placate my angry husband and be more like Mom (she was very organized and I loved the childhood home she looked after). You’ve probably heard this before: “Indecision is a decision within itself.” A decision made for the wrong reason is as fruitless as the decision not to decide. With this New Year welcoming us to a fresh start on as many levels as we choose, maybe the decision to get organized will actually work for you if you can get the right reason. Get organized for you, not your husband, not your mother-in-law, not anyone but you. Getting organized for you means getting organized so you have more free time to play, read, travel, sing, dance whatever makes you happy. “Get back in the Box” would be really good for you if you’ve been in it before. If you’ve never been in the box, this is a perfect time to get in it for the first time. It couldn’t be easier and it’s so inexpensive. $14.95 will get you in the box today, because now the template for the cards is on a file you can download and then you just print out the cards onto card stock. And you get to download the Sidetracked Sister’s De-junking video with it. The files are also available on a CD and when you get the CD you also get the Sidetracked Sister’s Dejunking DVD which will show you the basics of de-junking your home. What do you have to lose? Make a decision for the right reason now and I'll see you on the other side of chaos! .